I knew the label CTA from a bootleg CD of Antonio Bonavena. My friend Simon got this bootleg CD from Buenos Aires, as he liked it very much, he made me a copy. Looking at that poor photocopied CD cover, at first I thought CTA was just a homemade CD label created by Argentinian collectors. Not very soon after, I figured out that the CD was actually a bootleg copy of a real CD in Japan. Followed the discussion on internet, I knew that this famous label is created by Mr. Akihito Baba (馬場明人), and his CDs have been sought after by tango music collectors and DJs around the world. Despite hearing so much about this Japanese legend among collectors, I never saw any real discs myself, and not even talked about buying one. It was only until my stay in Tokyo, I finally managed to have a closer look to this legendary label. CTA's LPs issued in the 80s and 90s. The whole series of CTA consists of both well known and the forgotten orchestras. Names like Antonio Bonavena, Juan Cambarerri and Cristobal Herrero might only attract collectors and serious tango music lovers. But if you happen to like these less known musicians’ music, very likely you would become a fan of CTA, because it might be the only available source to get the music you want. Even it might not be the only source, most likely it is the best among others. However, I believe the most sought after CDs in the series are those of the big names like D’Arienzo, Canaro and Orquesta Tipica Victor. There are total 50 CDs of D’Arienzo (Johan from Belgium provides this information. Thank you! ), each contains 20 songs. The whole set almost completes D’Arienzo’s discography, the biggest set of D’Arienzo CD ever exists. 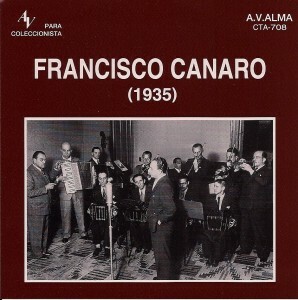 Canaro recorded more than 3000 titles, his music in the 30s is his best period yet the number of songs available on the CD markets covers only small part of it. 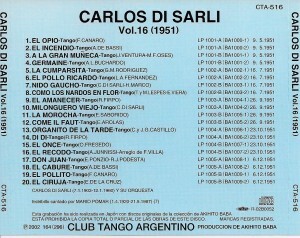 The 9 (or more) CDs of Canaro contains recordings from 1931 to 1941 are still the best source for DJs and collectors to hear and obtain the “unknown” Canaro pieces. Johan (Thanks!) mentioned that the total CTA collection of Canaro consists of at least 44 CDs! Same story goes to the recording of Orquesta Tipica Victor. It seems there is at least 16 CDs of O.T.V. in the series, compared to the 5 to 6 CDs available from the current tango CD market, we have to wonder how little we know about this orchestra. I bought the bootleg copies of this Canaro set in Bs.As. in 2004. I'm glad I can get the real one in Japan. 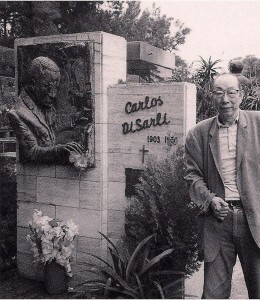 As a big fan of Di Sarli’s Music Hall recordings (1951-1954), I can tell you the 3 CDs of Di Sarli (CTA 516, 517 & 518) are the best among all the Di Sarli CDs of the same period. Not only they are the most comprehensive, covering 64 out of 84 titles, they are the clearest transfer I have ever heard, compared to those private transfer and those I have from DyD (Grafisound). 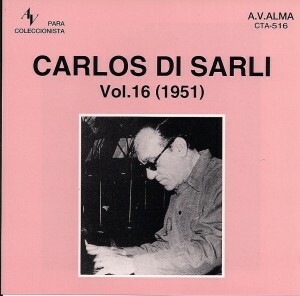 Cover of CTA516, Di Sarli's Music Hall recordings. P.S. Just noticed that Mr. Baba has a short statement in his CTA site: 尚、アルゼンチンのクルブ・デル・タンゴやキオスク・デル・タンゴで販売しているＣＤは, すべて海賊版のコピーで、当会とは一切関係ありませんので御注意下さい。A brief translation of this statement: Please aware that the CDs sold in Club de Tango and Kiosko de Tango in Argentina are bootleg copies, CTA has no relation with them. A photo of Mr. Akihito Baba inside one of his CDs. This entry was posted	on Wednesday, September 30th, 2009 at 3:11 am	and is filed under Music. You can follow any responses to this entry through the RSS 2.0 feed. You can leave a response, or trackback from your own site. Thanks for the discussion on CTA series. What is the quality of the transfer compared to something like 78RPM series? I’d be interested in building up my Canaro collection because as you said most of the commercially available stuff is from the 40′s. I agree also that there is a lot of great stuff in OTV recordings. When I was in BsAs I didn’t see any ‘bootleg’ CDs. Were they sold in shops? Or did you need to go to some back alleys? I am rather curious about your take on Music Hall recordings since I don’t have CDs from there. According to this link http://users.telenet.be/tangoteca/tango_sellos/index.html, “they (together with TK) were notable for their low quality discs”? My take on Music Hall recordings is rather personal I think. Actually it’s not a really a matter of Music Hall, overall I just like the period of early 50s. I like Troilo’s TK recordings, which belongs to the same period, and I like D’Arienzo’s early 50s recording. For me, this period of time is a transition of style – from rather simple and basic music purposely made for dancing, to more sophisticated and elaborated music, which is still good for dancing but richer for listening. The rest of the time in the 50s, tango music gradually moved away from the dance floor. The music became more innovative, elaborate and dramatic, but it pleases more the ears than the feet. What Johan wrote in his article is right. The recording quality of Music Hall and TK are not as good as those of Odeon and RCA. MH and TK already disappeared and their matrices were most likely lost. Nowadays, to hear the original quality of their recordings, either you have their SP or LP in good condition, or you get good reissued CDs. I bet most people don’t have the chance to listen to the original discs, and good reissued CDs didn’t exist until Archivo-TK (Troilo’s TK recordings) appeared. Unfornately for Di Sarli, the only available source so far on the market (outside Japan) is Orfeon and Grafisound (an unknown label to me and I even forgot where I got it). And even these reissued CDs are hard to get. As there’s hardly any resources and information available about this period, and there are already many great stuff to listen and play among the RCA recordings, people just tend to ignore MH and TK. I have to correct what I wrote in my post, as I just figured out that the Di Sarli CD I have is from Grafisound but not Orfeon (though I have a Troilo one). I cannot compare the quality of Orfeon’s CD to those from CTA. My mistake. But still, the CTA versions are clearer than those from Grafisound. A good question about the transfer quality. I need to write a separate post on it with sample sound clips. That will take a bit of time, please be patient. I used to get them at Club de Tango. But the last time I went there (in 2008), I didn’t see those bootleg CDs. The founder Oscar Himschoot passed away few years back, now his daughter takes care of the business. So she might just stop selling it or maybe you have to ask her. When I bought my bootleg CDs, I bought them from Oscar Himschoot. Great series of posts. It really is a pity the CTA discs aren’t more easily available. Thank you! Maybe 1 or 2 more posts to come on this subject. The production of CTA discs is small. Once they are sold out, then there’s no way to get them other than copying them from someone or buying second hand. And unfortunately, even these two “alternatives” are not easy to do. In a way, we should thank the Argentinians who turned part of this collection into bootleg discs, thus we could access some of these gems. Hello All, I am a collector of Orquesta Tipica Victor playing Tangos, Valses and Milongas and have a very large collection. 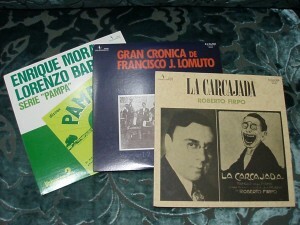 These include many 78 rpm records, cd’s and also the CTA (Baba) cd’s Vols.1-16 which I bought in Buenos Aires. Does anyone know when Vol.17 of Orquesta Tipica Victor CTA is coming out? There’re many SP of Orchestra Tipica Victor on ebay, not exactly what I want, but it’s interesting to know there’re people selling them. Thank you! Thank you for sharing the news. I just have 1 question – are they commercially pressed CDs or computer burned CDs?